9Mobile has Introduced time base data plans known as BlazeOn for unlimited browsing and downloading. I think is a welcome development and will be of great benefit for those of you that have some heavy files to download and also fast 9Mobile (Etisalat) network. Recall that Airtel was the first to introduce timely based data plan back in 2015 and it was subscribers favorite because you can download unlimited with it for 1hour with just N180 although something went wrong later along the line when they increased the price and the plan gradually fade away. 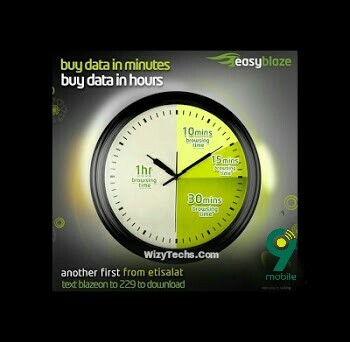 This 9Mobile timely base data plans is made possible via an app called BlazeOn, powered by Comptel’s FWD solution. According to 9Mobile “Most Internet users in Nigeria don’t know how much mobile data they consume while browsing or streaming", hence the launch of BlazeOn. For now am sure the app is available for Android users but might be rolled out for iOS devices soon. But let's look at the plans, prices and how they work below. You can get 10min for N50, 15min for N70, 30min for N120 or go for the 1hour plan. Within the jurisdiction of this usage, you can download unlimited until your time expires. Set up the app and you are good to go. After downloading the app, register and send "BLAZEON" to "229" (without the quote) and you should get your free 200mb. Note: this plan is advisable only if 9Mobile network in your area is very fast otherwise you might regret it. In this case, time na money. What do you think? thanks for the informative update. Then uroot it may there will be a positive change. pls oga but how much is the cost for 1hour. It's a welcome development but i got no strong Etisalat network in my crib. This is not meant for me. Then what network is strong in ur area.i have been watching always complaining about network.perharps where do you live. Then you have to find a location where there is network. I'm based there because that's where I'm working for now till I'm transferred to the town. But wizy, does it still work when u already have an active bundle? Yes because I always did this timely bundle when I have a active data plan. And I also channel this same question to etisalat customers care line and they told me yes I can do it. Oga wizytechs if I Sub na unlimited 4 dat minutes? The process to select the plan is stated above. He never asked for the process please but rather he wants to know if the plan is unlimited. How much is 1hr plan? just use hide my root app instead of unrooting your device. It is a nice idea but there will be hidden terms and conditions such as speed throttling when you reach a particular amount of data and fair usage policy. This app doesn't work as advertised. I tried it by buying 1hr for N200, started downloading and after about 20mins it told me I have exhausted my usage. This Etisalat is defrauding us. Please beware. Thanks for pointing this out. Other users and intending users shout please take note and act accordingly. Instead of them to find tune a way to solve their problems they are looking for ways of defrauding people. That also happens to me also.when the time have not reach they told it is exhausted. etisalat i know are always upto something..
if you ask me i will say ds unlimited data is just a hidden specified amount of mb shikina..
After replying to LOOKMAN'S comment, i decided to check Google Playstore for more in depth analysis of the said app from Etisalat and behold my discoveries were shocking. There was no single individual say had said anything positive about this app. So let everyone out there have a re-think about using this app. So like how many gigabytes have you pulled so far? Is this their new way of defrauding customers so that they can use the money in paying back their huge N541 billion debt? An adage goes thus Old is gold but how true is it with reference to this 9mobile app. As at when this app was first introduced and judging from our previous comments, am tempted to ask if the initial flaws have all been fixed. Wizy is the data really unlimited within the stipulated time frame. Yes from the experience I got when I did mine it is unlimited. It is unlimited for the time you subscribe for. Have just checked it again and it's working perfectly well. And make sure that WhatsApp is installed in your phone. this all good but I don't think I will subscribe for now because you won't use up to the time you subscribe for. that why I love the formal airtel unlimited night plan. I did the registration after downloading the app and sent the text but didn't get the data. Since you have downloaded the apk and fill the required information and didn't work out for you, why not call the customer care line for asistance, that how i did mine and between the next 24hours i was offered mine. Please how much will I pay per hour? please I have been using this app since August. 2017.. The packages are capped for the 200 / 1hr package is capped at 1.5gig.. If you use up-to 1.5gig before the one hour the app will automatically cancel the remaining mins. Thank you very much sir for the update, it was very I will give it a try.